ONLY ONE MONTH LEFT for the lowest prices of the season! We can’t believe that it’s already October and time to clear our shelves! 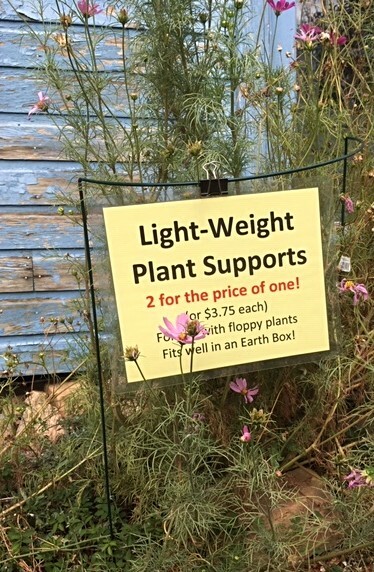 We have many bargains to share with you from soil products, fertilizers, pest products, planting containers to veggie starts, roses, perennials, shrubs and trees (the sooner you get these gems in the ground, the better!). We look forward to seeing you this week! We’re open seven days a week, 9 AM to 5 PM through the end of October. (We’re no longer open until 6 PM on Thursdays.) We will then re-open for our fabulous 7th Annual HOLIDAY GIFT MARKET Green Friday, Nov. 23 – Dec. 24, every Thursday, Friday, Saturday, and Sunday from 10 AM to 5 PM. Stay tuned for more details! Mikl has just added dozens of roses to our Deep Discount Area! Previously $26 to $30, these roses are now only $5 to $8 each! While these seconds may be a little homely, they are own-root roses that will grow to be strong, healthy roses with a little TLC from you! Befriend a rose or two – and even take a gamble on a mystery rose – they will brighten your garden next season! 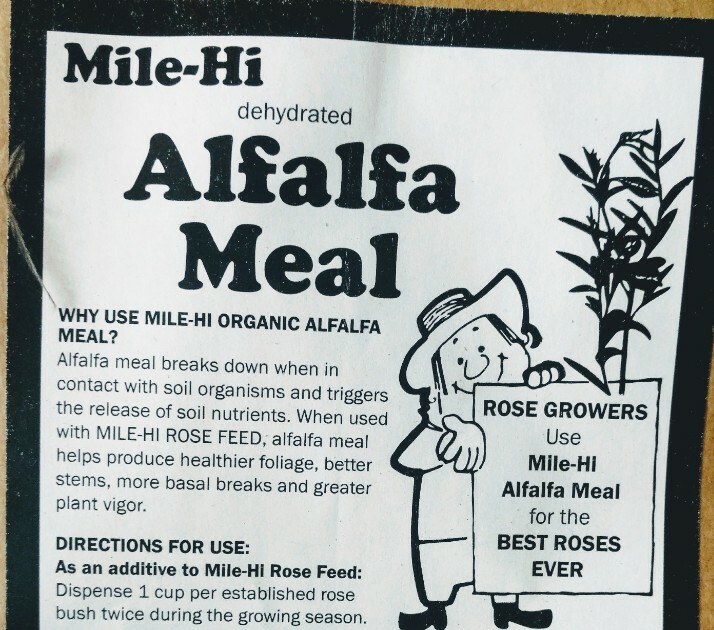 We are stocked with a good supply of Mile-Hi Rose Feed and Mile-Hi Alflafa Meal to support the establishment of your new roses, and to promote strength and vitality for your existing roses next season. 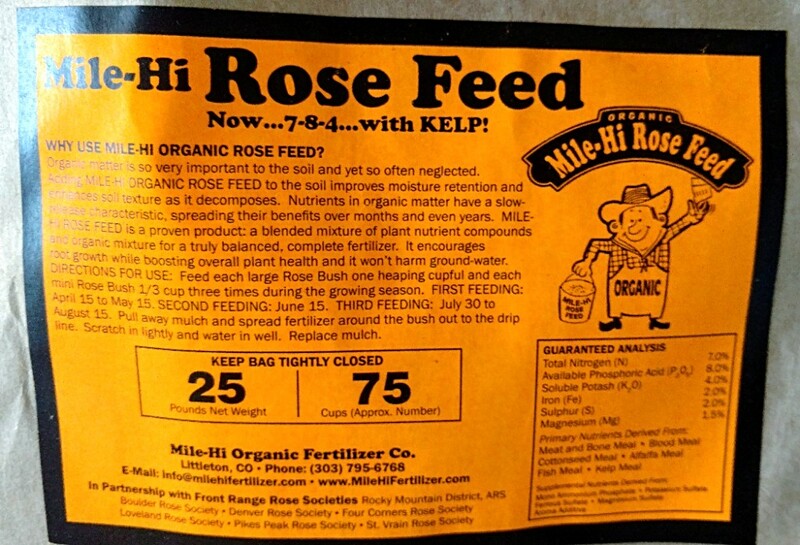 And don’t worry, it’s not too late in the season to use this locally made, organic, slow release fertilizer! GARLIC IS IN THE HOUSE! Fall is here and for many that means it’s time to plant garlic and shallot bulbs – yay! We have a wonderful selection and hope you come in soon for the best choices! 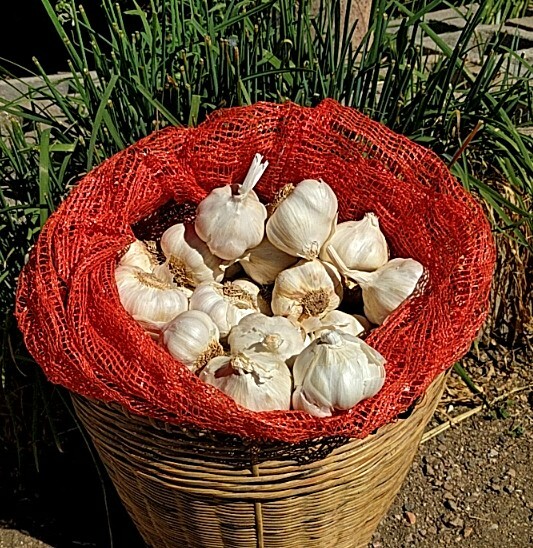 Visit our website for Garlic Planting Instructions. This large bright purple bulb contains 8-12, extra easy-to-peel, round, light brown cloves with some purple at the base. Flavor is strong, hot, and spicy. Keeps moderately well when properly cured and stored. 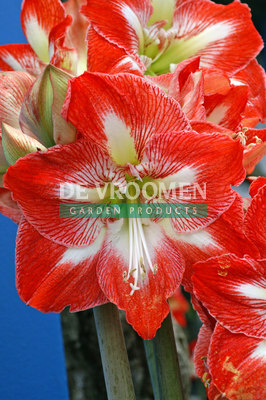 Can be grown in mild climates; However, develops better quality and size where winters are cold. Color will become brighter if it is stressed by too much water. Large 3″ + bulbs produce 8-20 cloves of good size. Mild, but lasting flavor, with a hint of hot! Dense cloves store well. Flavor can get stronger in stor age. This vigorous soft-necked variety won a Rodale taste test of 20 garlic strains – named “Very Best of the Soft-Necks”. Light colored wrappers covering cloves which are generally fat and round. The extra-tight skin makes it a better keeper. This variety matures later than Early Italian Purple and tends to be somewhat smaller then Early Italian Purple as well. Good braiding type. Shallots are aromatic and flavorful, yet smoother and sweeter than Onions or Garlic, and act as a catalyst in recipes, subtly enhancing other flavors. They are mild and delicate when cooked. If onions are at all upsetting to your stomach, you’ll find Shallots much easier to digest and less sharp smelling, both raw and cooked. Shallots are easy to grow, and each set produces a whole cluster of bulbs. ‘Holland Red’ delivers mellow, quintessential Shallot flavor in a plump, round bulb with coppery-red skins that peel easily, and purple-tinged white flesh with reddish-purple inner rings. A super-productive variety and an excellent keeper that can be braided and hung in your kitchen or pantry. They keep this way for up to 1 year! 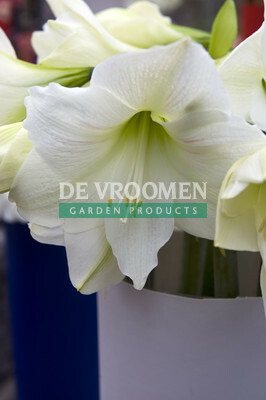 ‘Holland Yellow’ provides most of the same qualities, but has white flesh and tan-yellow skins. 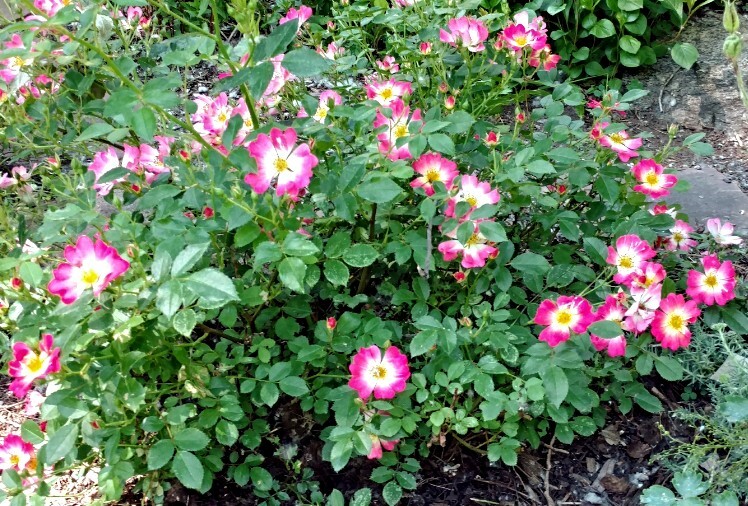 Grow in full sun, spaced 4-6” apart in rich loamy soil. Cold-hardy to Zone 3. 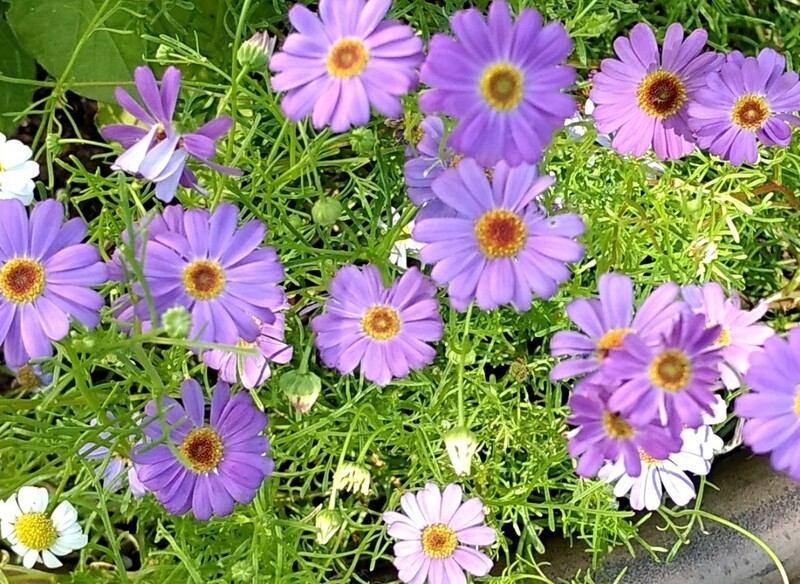 4” perennials in full flats of 12 or 15 plants are ONLY $4.20 each (regularly $6.95). Mix & Match! 2 ½” pots reduced from $3.95 to $1.75; Quarts reduced from $6.95 to $4. trees and shrubs specials. Hen & Chicks are $0.50 each. 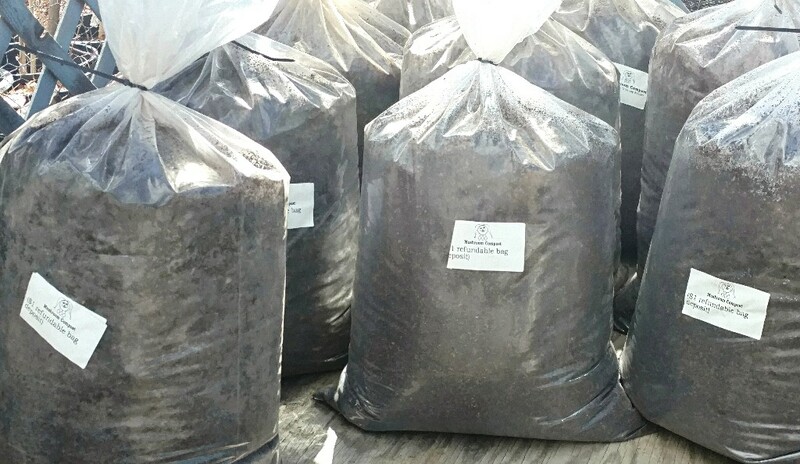 Many of our big bag soil products are sold out – but don’t worry, we’re committed to having a steady supply of good quality compost and fine wood chip mulch through the end of the season! And at 50% off, this is a great time to stock up! 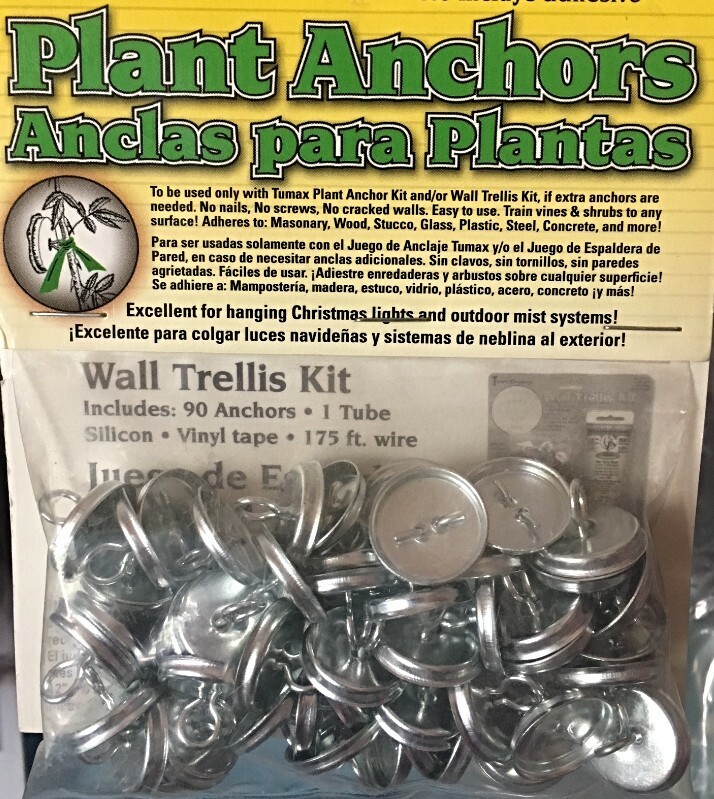 Nothing like an easy bulb kit to help you kick-start your holiday bulb planting! 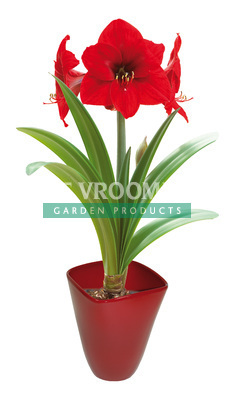 Our kit includes your choice of bulb (pictured and listed below), pot, and potting compost. Earthboxes are a wonderful invention for those of us in need of watering and fertilizing assistance! 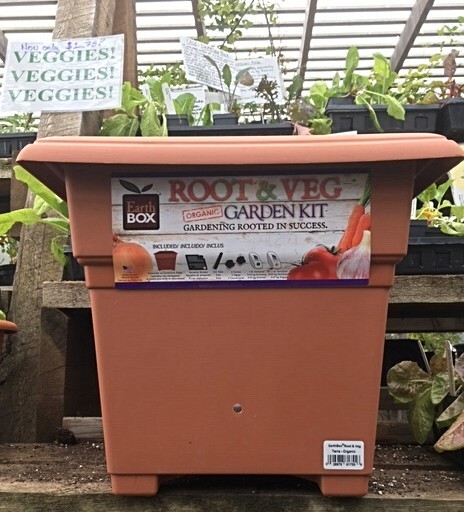 Set-up your Earthbox at the beginning of the season with the included dolomite and fertilizer, plant with your favorite veggies and/or flowers, and fill the water reservoir. Then, all you need to to is top the water reservoir every week or so, depending on climatic conditions. And best yet, this $64 regularly priced kit is now only $40!! These tools can help you keep even the most unruly plants supported, which can be a challenge for all gardeners. (Pictured above, left.) These sturdy stakes are essential for those heavy-flowered plants such as peony. We’ve reduce their price so that two stakes are now the price on one! (Pictured above, right.) Simply glue the round disc to your vertical surface, feed nursery tape, twine, fishing line, etc. 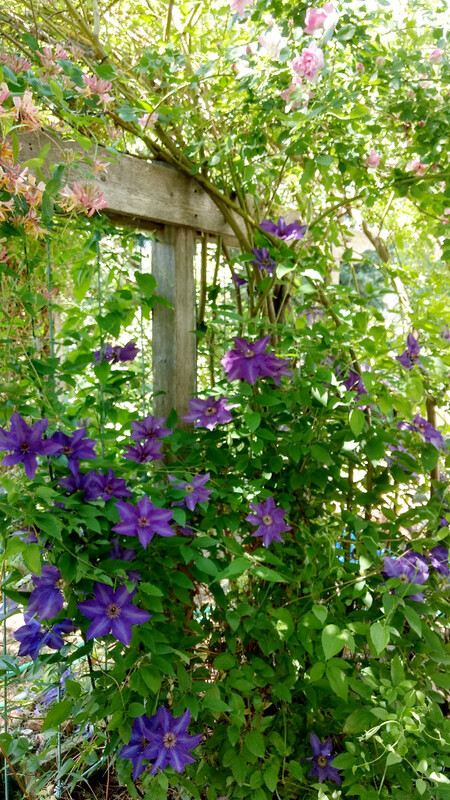 through the loop and you’ve created a subtle, yet effective trellis for your vine! And guess what? They are Free! Many of our ever-popular and very effective Pharm products are on sale – come in to find out more!! Fight grasshoppers with non-toxic grasshopper spore, safe for everything except grasshoppers and crickets! 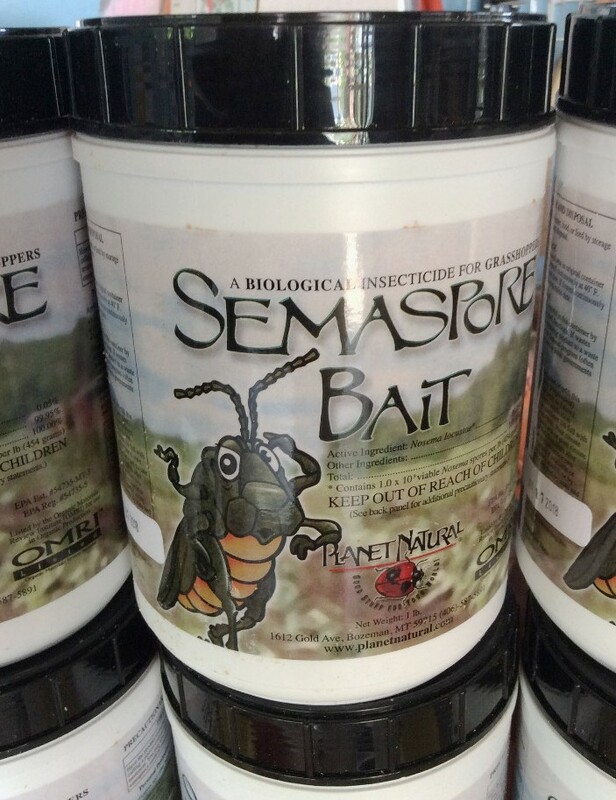 Our 1 pound containers of Semaspore Grasshopper Bait are now only $12 (regularly $25). foundation-less frames are now 50% off! Try something new next spring! Make cut comb honey. Best to place between frames with foundation or drawn comb. 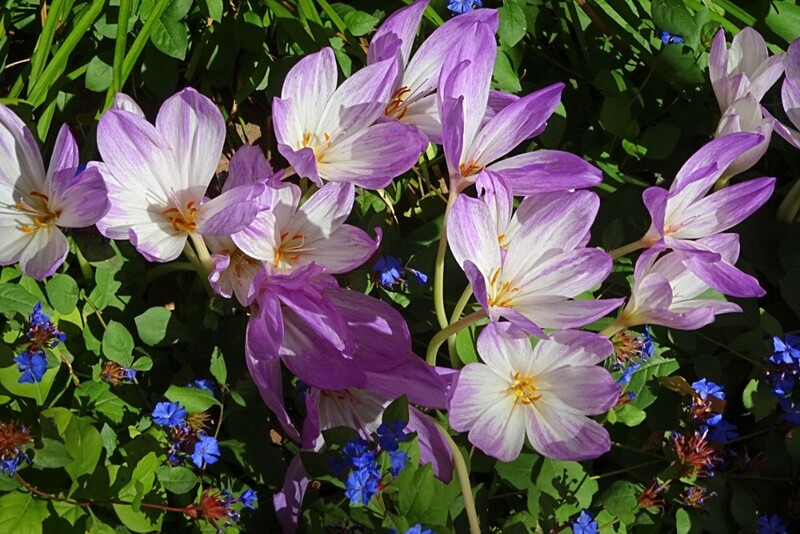 Spring and fall blooming bulbs are here, and selling fast! A few more varieties will arrive in early October! While we recommend that bulbs be planted in October and November for best results, there are Autumn-blooming Crocus that should be planted as soon as possible to get blooms this fall. Newly planted Colchium speciosum ‘The Giant’ (pictured left with Plumbago in Eve’s garden) will bloom in a few weeks if planted NOW. Saffron Crocus (Crocus sativus) will bloom in October or November if planted NOWRichly scented Narcissus ‘Paperwhite Ziva’ should be forced soon for holiday blooms to bloom in time for the Holiday Season. Paperwhites are beautiful and richly fragrant. Know anyone that would also enjoy receiving our blogs? If so, forward this blog to them and they can click here to subscribe. Please follow us on Facebook, Instagram and Twitter for the most up-to-date information and photos! We’re looking forward to seeing you this week! This entry was posted in Blog by Rebecca Waterhouse. Bookmark the permalink.